Preparing a meal with wild mushrooms that you collected yourself is a deliciously gratifying experience. However, consuming mushrooms can be dangerous, even lethal, if you cannot adequately distinguish edible from poisonous varieties. Although no single, easy method exists for telling a poisonous from an edible mushroom, familiarize yourself with the varieties in your area and learn how to identify them, so you can tell which mushrooms you can eat or not. Familiarize yourself with the mushrooms native to your area. Purchase a mushroom identification book with spore prints and full descriptions. Focus at first on the most common edible mushrooms and the most deadly varieties, especially the Death Cap and the Destroying Angel. Go on a foraging expedition with an expert mushroom hunter. 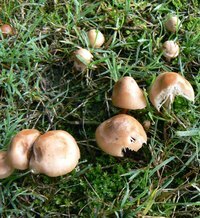 Search for mycological societies in your area, as they often offer beginner courses on mushroom hunting. Collect the mushrooms you wish to identify. Always practice safe collecting techniques: Wear gloves, avoid rubbing your eyes or lips and avoid local wildlife such as snakes and insects. Wrap each mushroom in wax paper and make a note of where you found it, including what kind of tree, plant or ground it is growing on. Some poisonous mushrooms closely resemble edible varieties, and you may need to cut the mushroom open to determine what kind it is. Try to select young, fresh mushrooms without insect damage. Older mushrooms can change color, making them harder to identify correctly. Bring your mushrooms home; never try to identify mushrooms in the field. Compare your live specimens to the pictures in your field guide and consult the descriptions to match the habitat of the mushrooms you found. Make a spore print by cutting off the stem of the mushroom and put the cap gill-side-down on a sheet of white paper with a sheet of black paper taped to the back. Cover the cap with a jar or a bowl and let it sit for 12 hours. The spores will settle, and you will be able to see their color, which you can match to the spores in your field guide. Ask a local mushroom expert or send a picture with pertinent information to an online mushroom identifier if you are not absolutely certain what type of mushroom you have found. Los Angeles Mycological Society: Edible or Poisonous? Is Tree Fungus Dangerous to Humans?